I had five days on bike into south tropical Vietnam following the famed Ho Chi Minh Trail, the supply route that leads thought forbidding jungle celebrated in a thousand Hollywood movies as an inhospitable place alive with all manner of ferocious mammals insects and reptiles all hell bent of inflicting a myriad of horrible experiences upon any wretched soul who has the misfortune to pass this way. As I learn more about the history of the Ho Chi Minh Trail begins to take shape with a far sharper outline than my previous blurred knowledge of what led to the American War and the necessity of the trail. From my lessons so far I understand that by 1954 politics were, to say the least, unstable. Ho Chi Minh’s Communist Party was officially in power having given the French a decisive drubbing at Dien Bien Phu and unceremoniously booted them out. Uncle Ho, as he was affectionately referred to, swept to power in the first national election in a jolly long time. Ho’s communists were less than sympathetic to the nations catholic who they saw as friends of the French and American’s, people for whom the Communist Party felt no allegiance and very little sympathy. The Communist Party had their capital and the parliament that presided over the Socialist Republic of Vietnam in the northern city of Hanoi, whilst in the far south Saigon was the seat of parliament of the Catholic Party, rulers of the Republic of Vietnam, friends of the West, allies of The United States, sympathisers with the French and so, thoroughly dislikes by the communists. At this time Saigon was the most sophisticated city in South East Asia, a city of fine architecture, wide leafy boulevards and a level of development that left Bangkok, Kuala lumpur and Singapore looking like provincial backwaters. 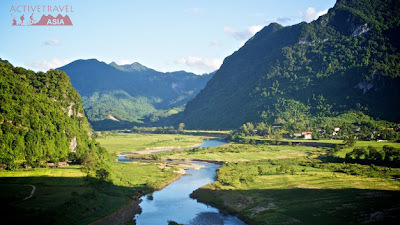 The nation was, in all respects, two nations with the country split conveniently across the middle by a UN imposed border 14 kilometers wide with the Ben Hai River running through the middle of it. The border was, apparently, a demilitarised zone, known as The DMZ and was a barrier designed to stop any cross border conflict, a fine and noble idea except that, then as now, nobody took a blind bit of notice of the United Nations. Whilst the folks of Saigon were enjoying the good life, far away in the north the government in Hanoi was becoming a touch agitated with what they saw as the splitting of their nation, a situation they intended to rectify. All was not quite as rosy as it could be in the south either, with a fair faction of the population eager to follow the bidding of Uncle Ho in the guise of The National Liberation Front. This organisation, better known in the Western world as the Vietcong, had been formed to help rid the South of Catholics, imperialists and all other enemies of communism that helped keep Saigon in such a fine condition. These freedom-fighters/guerrillas/resistance fighters/terrorists -delete as you see applicable – needed supplying, as did the ever growing number of Communist troops congregating south of the DMZ. The logistical problem of supplying the Communist forces in the far south would to most people have seemed insurmountable. The DMZ was around 700KMS south of Hanoi, Saigon a further 1100KMS. Sea was the easiest option for supply but as we all know the advisory capacity of The Americans in this civil war soon became a fully fledged military intervention, and their navy was not inconsiderable. But the jungle was to the Americans what the US navy was to the army of the north, and so it became the ally of the Communist forces in the shape of the route we now follow, Ho Chi Minh Trail. 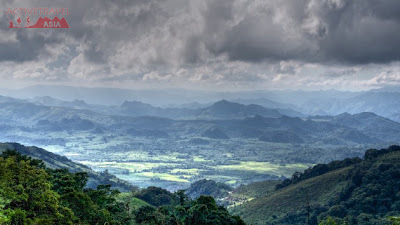 Originally a series of trails dating back centuries as trade routes through one of SE Asia’s most inhospitable regions a network or trails crisscrossed through jungle, across mountains and through Valleys. The route soon became essential to the military operation of the Communists and by 1964 it was estimated that over 200 tons per day and up to 9000 men per year were reaching the south along the Ho Chi Minh Trail. 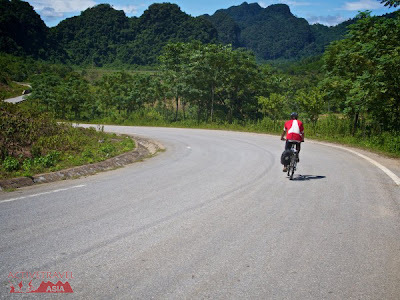 The route, or series of routes, led not only through Vietnam but also through Lao. It was tough, inhospitable and many who set out along it never reached their destinations. In the year 2000 the then prime minister gave the go ahead to link up the most suitable of these small roads and trails to form an inland alternative to the oh so congested Highway 1. By 2005 it was pretty much complete. In places it splits, with two or more alternative routes. At times we come across smaller roads that parallel the HCM, or cut between the east and west options. Some of these alternatives we explore as we go.